Festo is an industry leader in advanced robotics and they have presented two of their projects: BionicANTs and eMotionButterfiles only made possible by using laser sintering 3D printing and 3D MID ( Molded Interconnect Device) technology. 3D MID is a control and power system where electrical circuits are attached on the surface of the laser sintered body components during the construction, and they thereby take on design and electrical functions at the same time. In this way, all the technical components can be fitted into or on the 3D printed body and be exactly coordinated with each other for complex actions of a insectoid robot. 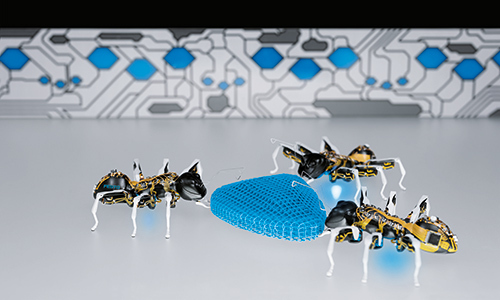 BionicANTS are biomimetic robots that modeled to resemble real ants in anatomy and behaviour. ANT stands for Autonomous Networking Technologies, and they are designed as a sort of small prototype of future applications the factory floor, where the production systems will be founded on adaptable and intelligent components able to work under a higher overall control hierarchy. Their body as well as software mimic natural behaviour of group of ants working together. Each BionicANT measures 13.5 cm (5.3 in) and runs on two 7.2 V batteries charged when the antennae touch metal bars running along the sides of an enclosure. With on-board batteries the ANT can work for 40 minutes. 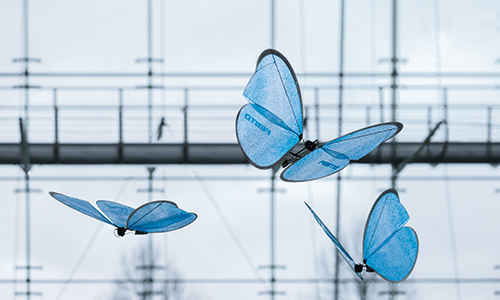 Designed to mimic real butterflies, this small robots are ultralight and have coordinated flying behaviour in a collective. They are are able to autonomously avoid crashing into each other in real-time controlled by networked external guidance and monitoring system with 10 cameras, interior GPS and IR markers on their bodies. The entire system is very impressive combination of prcise guidance, raw processing power, optical tracking and delicate 3D printed flying robot design. I do not fear 3D printed robotic insects. They most likely come as friends. Most likely. When it comes to architecture, professionals are using 3D printing techniques to create lots of different things. All eyes are on WinSun, the Chinese company that 3D prints entire buildings, but there are many more interesting projects to discover. A 3D printed wall? Check. Architectural artworks? Check. A 3D printed cocoon to bring you in a state of meditation? No, we haven’t heard that one before. Nevertheless, this is what French company Meïsō has been working on. 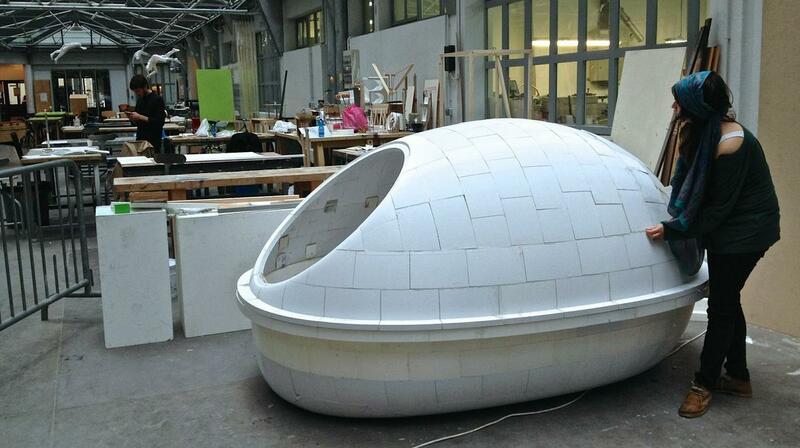 Their 3D printed meditational cocoon will be unveiled in Paris next month. This cocoon is a floatation tank, also known as an isolation tank. The idea is to step into the ‘tank’ without clothes and to lie in salt water. Stress and anxiety seem to go away, and what stays is a state of relaxation. So that was the idea, and Meïsō discovered that this kind of therapy wasn’t huge or anything near that in France yet. By using 3D printing techniques, the company was able to create a floatation tank in a faster and cheaper way. The costs? 4,000 euros for the 3D printed pre-mold, and 1,000 euros for the industrial mold. They saved as much as 60,000 euros thank to the technique. So how long did it take them to create something like this with 3D printing techniques? The printing time for all 500 individual bricks was three months. They then combined those bricks and assembled them to create the float tank. Another two weeks were required to coat and sand the float tank, and it was painted and coated in fiberglass. If you would to under a new experience which combines 3D printing with architecture and therapy, then the La Paillasse float space in Paris is the place for you to visit. This is where the prototype is currently being installed. It will be unveiled next month. So who are the potential users of such a meditational cocoon? Obviously, people who suffer from stress are the target group, but it also seems to be useful in different situations. People who suffer from chronic back pain, pregnant women in their last semester and trained athletes can make use of this cocoon. Will it help? We guess they have to find that out themselves.